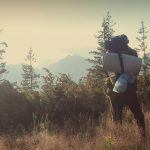 Are you looking for the best packing cubes for backpacking? 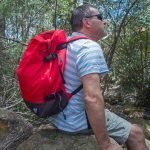 Are you like us and travel with a backpack and so want to know which are the best packing cubes for backpacks? Well you are in luck because I absolutely love everything about packing cubes for travel and thing they are absolutely essential to not only travelling light but also to travel well organized and efficiently. 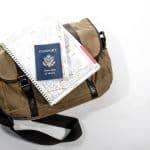 In this guide I will answer all your questions about packing cubes and hopefully convince you why you should be using packing cubes for travel too! 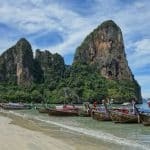 I will then take you through how to use packing cubes as well as take a closer look at some of the best travel cubes for backpacking currently available. 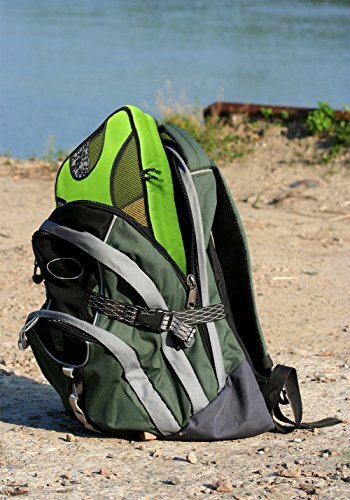 Whilst this guide mainly focuses on the best packing cubes for backpackers, the reality is these packing cubes would work just as well as packing cubes for suitcases or other luggage types as well. 3 Are Packing Cubes Worth it? 5 What are the best packing cubes to buy? 5.1 1. What Size Packing Cubes for Backpack? 5.2 2. How many Packing Cubes do you need? 6.11 Do you want to keep this handy for later? 6.12 Click on one of the images below to and save it to Pinterest. 6.13 You have Successfully Subscribed! 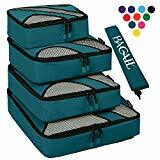 If you don’t have time to read all my best packing cubes reviews, my pick for the best travel packing cubes are the Bagail 4 set packing cubes. I love how they come in so many great colours so you can buy a set in different colours for each member of the family. The different sized cubes are great so you can change it up depending upon your trip and the nice square shape will fit easily into most backpacks. I also love the carry handles, as you are budget travellers there is not always somewhere to put your things so you easily hang these on a door and the mesh tops allow you to easily see whats inside. Click here to purchase these packing cubes, or keeping reading below to see all the reviews. 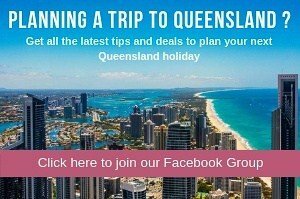 Australian readers, click here for information about these packing cubes. Check out the table below for a quick overview of the various features of my recommendations for the best packing cubes for travel. Keep reading below for my detailed reviews. Are packing cubes worth it? ABSOLUTELY!!! Ok so why use packing cubes for travel? Well for us packing cubes has made travel so much easier. Our things remain organized and packing cubes allow us to take less baggage with us. Packing cubes or not? Check out my reasons below for why I think you should definitely be using packing cubes. Click here to see your guide on the best backpacks for travelling carry on. 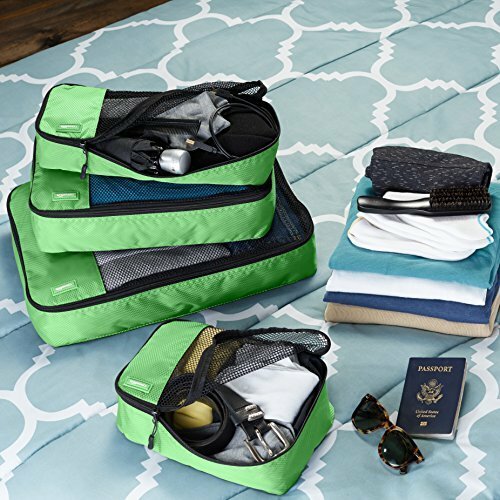 Rather than have your clothes, toiletries, and accessories just randomly thrown in your bag, travel cubes for packing allow you to organize your items into certain bags making it super easy to locate things when you travel. This is even more true if you are like us and usually share a bag between two or more people. If we are travelling to warmer destinations we can usually fit all of each person’s clothes into one med to large size packing cube. If we are going to colder destinations or multiple destinations with varying climates we might still do this and then put clothing items that we won’t use often during the trip in a different packing cube and put this cube at the bottom of the bag until needed. People often ask me do packing cubes work? Do packing cubes really save space? They sure do! 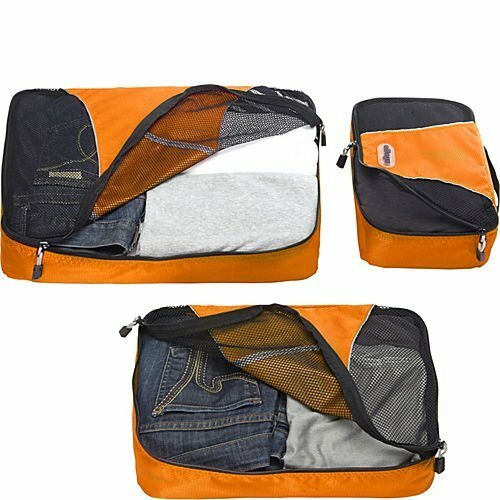 The best travel packing cubes help compress your clothing and therefore allow you to take less luggage. We use a combination of the rolling method or sometimes still fold certain things. But regardless of which method you use when you zip up your compression cubes for packing they squeeze out all the excess space, so you need less pace in your bag for your things. 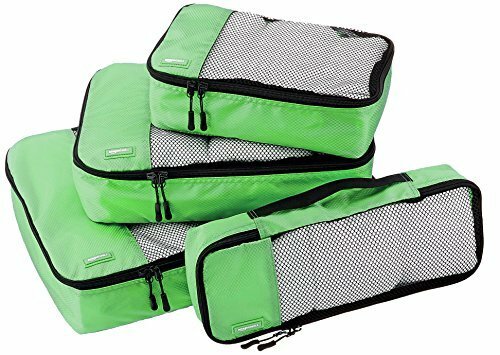 The best packing cubes for travel keep your bags super tidy and efficient. Gone are the days of taking out the entire contents of your bag to find one thing. You will only need to find the packing cube it is located. Even if you do have to take out multiple packing cubes, you don’t have all your stuff in a great mess. This is again even more true when sharing your bag with others. Myla and I often share a bag, so she knows exactly which is her packing cube and she is just takes that out of the bag rather than pull out everything. Packing cubes can help protect your clean clothes from your dirty clothes. We always take a spare packing cube for clothes that are dirty and fill it with our dirty clothes as we go. Then we simply take the dirty clothes packing cubes to the laundry mat. 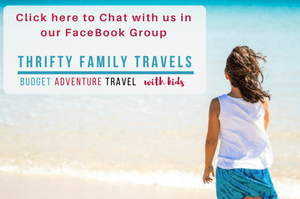 Travelling with little ones? Click here for our guide on lightweight travel strollers. Some people wonder are packing cubes worthwhile when they could just use zip lock bags. Sure, some people do that, but packing cubes are super eco friendly as you can use them time and time again. I am sure there are million different ways to use packing cubes in a backpack, so I am just going to share with you how we use packing cubes. I fold any bulky items, like jeans or denim shorts, and place them on the bottom of the packing cube. Then roll up all other large items like t shirts, dresses, skirts, shorts etc and place these on top of the items from step 1. Lastly, I roll up and small items like underwear, bras, swimmers etc and squeeze them in between the items from step 2. I usually leave out any large items like a jacket and pack these separately in the bottom of our backpacks – or often I just carry these on to the plane. All the above items fit into one large packing cube each for Andy and I and a medium packing cube for Myla. Click here to see our full packing list guide. Do not make the same mistake I initially did and just buy the cheapest packing cubes compression set you can find. After your first trip, or in fact even during your trip they are likely to break, and you will just end up buying another set anyway. Consider the below before deciding as to what are the best packing cubes to buy for you. 1. What Size Packing Cubes for Backpack? Whilst each packing cube size differs slightly, generally the packing cubes on sale come in small, medium or large sizes. What size packing cube for backpack? I find for us I can easily get 2 large packing cubes into our backpacks (I use a 46 L Osprey pack and Andy uses a 44 l pack) and a few smaller packing cubes on top. In Myla’s pack, she can easily get in a few medium sized packing cubes plus a few smaller ones. 2. How many Packing Cubes do you need? You really don’t need that many packing cubes per person. As mentioned above Andy and I tend to use one large packing cube each for all our clothes and Myla uses one medium one. This is suitable for us when travelling to warm destinations. Other packing cubes of various sizes come in handy for toiletries and various cables. We prefer to use multiple smaller sized packing cubes for our toiletries rather than one great big one as this way we can squeeze it into the smaller spaces in our packs. You really need to purchase a packing cube made from high quality durable fabric, otherwise it’s going to tear mid-way through your trip. I like the see throw mesh packing cubes (with mesh on at least one side) so its contents are easy to identify. Like the material the packing cube is constructed from, the best packing cubes system comes with good quality and durable zippers. If your zipper breaks and you can’t close your cube, it’s no good to you and you will just have to throw it away. YKK zippers are the best kind so look out for them. Also make sure the zipper goes all the way around, so you can completely flip your packing cube open for easy packing. One extra feature that I quite like on our packing cubes is a loop at the top, so you can hang you packing cube on a door handle or hook. This is particularly useful in tiny hotel rooms where there may not be room for everyone to store their items. The best rated packing cubes are pretty much all around the same price. If you find a set that seems particularly cheap, they are probably too good to be true. Good durable packing cubes are not overly expensive, so this is not an area to try and save a few dollars, you will no doubt only have to buy a good quality set later. By the same token, I don’t think there is any need to purchase a super expensive set of packing cubes either. 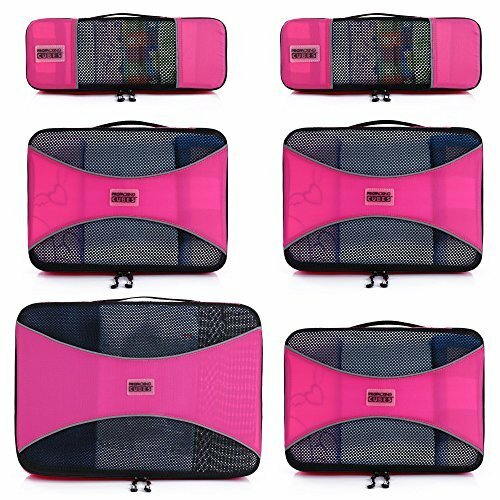 The TravelWise 5 piece set packing cube system is a great set for starting out and will help the entire families keep their things neat and tidy. This set comes with 2 large packing cubes, 2 medium packing cubes and 1 small packing cube. They are constructed from high quality, light weight nylon and have a breathable mesh design so you can easily identify what items are in which cube. 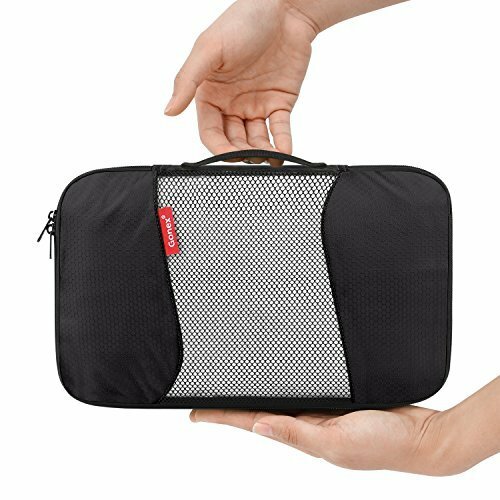 Due to their lightweight, these packing cubes won’t add unnecessary weight to your bag, so perfect if you are looking for the best packing cubes for carry on luggage. These cubes also come in 7 different colour and if you are buying multiple sets, I recommend you buy different coloured sets, so each member of the family can easily identify their own. This is particularly helpful when sharing bags. Click here to check the price and read more reviews. Australian readers, click here for the current AUD price for these packing cubes. 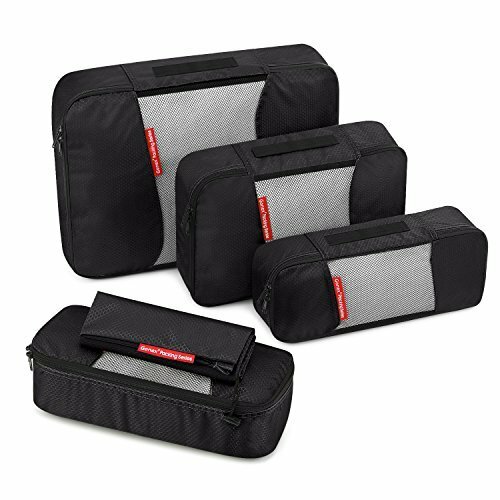 These Gonex 5 piece packing cubes compression bags are a super lightweight system to help make packing for your holiday easy and convenient. This set consists of 1 large, 1 slim, 1 laundry bag and 2 small packing cubes. Made from light weight durable honeycomb nylon fabric with user friendly zippers and handles. The honeycomb mesh lets you see what’s inside each cube to easily find what you are looking for and the carry handles make for easy carrying and hanging. Overall, these packing cubes make for a very organized and efficient packing system. These packs come in 5 different colours and are a great choice if you are after the best packing cubes for backpack. 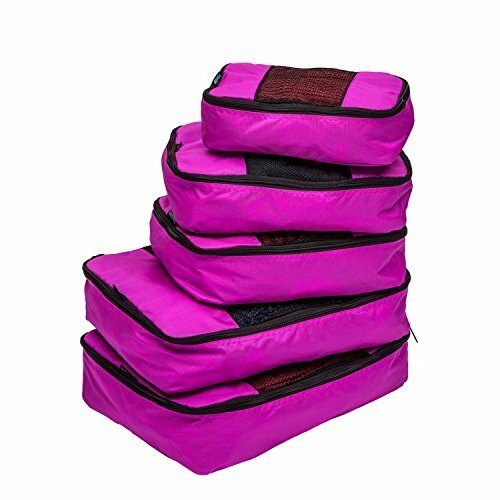 This set of 7 Free Rhythm packing cubes will ensure you have all your items neatly placed in your backpack making packing and unpacking a dream. This is the largest set of packing cubes in these reviews. 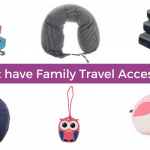 The set includes 1 small packing cube, 1 medium travel cube, 2 large packing cubes, 1 toiletry bag, 1 shoe bag and 1 laundry bag- a must for all those organised travellers. These packing cubes are made from high quality polyester and come in 2 colours. They have strong stitching and super reliable zippers that are backed by a 5 year warranty. They also have carry handles so you can hang your cubes in your hotel. 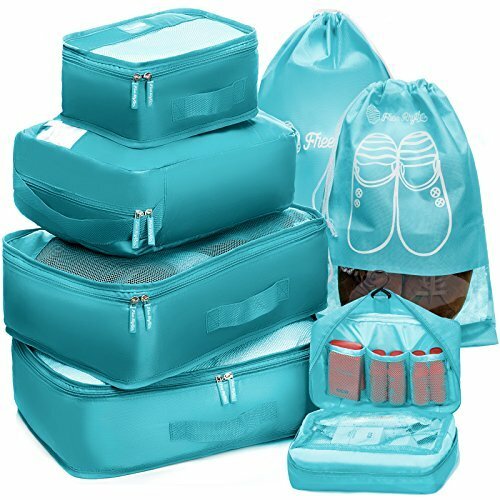 The packing cubes for shoes easily fits 2 pairs of adult shoes and the laundry bag will aid in keeping the dirty clothes separate on the return trip. 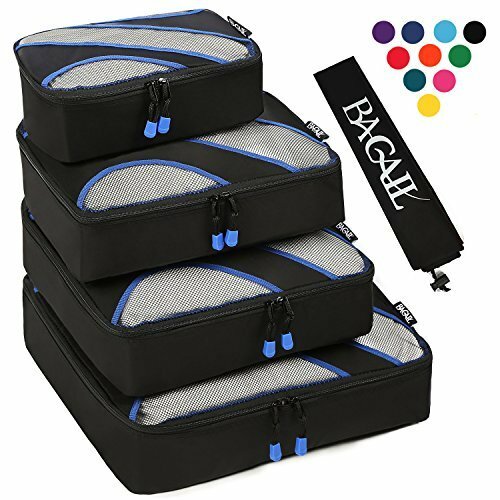 This 4 piece Bagail cube packing set will come in handy if sitting on your backpack to zip it up is a regular occurrence when packing for a trip. This set includes, 1 extra large, 1 large, 1 medium and 1 small cube plus an additional laundry bag, that are easy to stack. Additionally, these cubes with their grab handles makes them very versatile, allowing you to use the larger ones for your clothes and the smaller ones as toiletry bags. Each cube is made of high quality nylon and comes in 14 different colours from plain black to bright yellow. The convenient mesh top panel allows you to find things easily whilst airing your clothes and keeping them compressed. 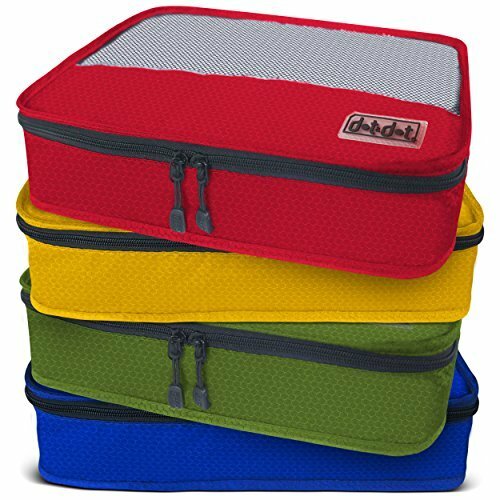 I would highly recommend these Bagail 4 set packing cubes to the over-packer travellers that have never used packing cubes before. 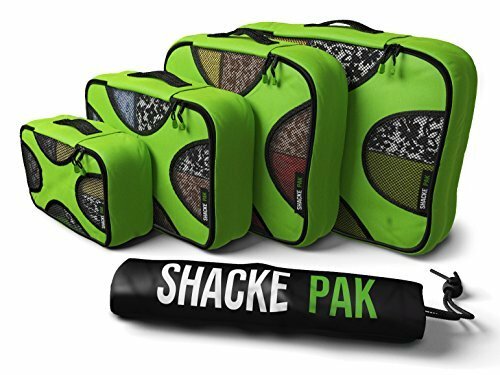 This 4 piece Shacke Pak cube setwill make your holiday packing less of an ordeal and more of a delight. The set comes with an extra-large, large, medium and small plus a laundry bag to separate all your dirty garments for the trip home. These cubes are super lightweight and come in 7 fun colours. The cubes are made from water resistant nylon with reinforced stitching to ensure the fabric doesn’t give in the middle and include extra large zips to ensure they don’t get caught on the side material. Each cube has 4 semi circle mesh windows allowing you to easily find items in addition to allowing the cubes to breath. 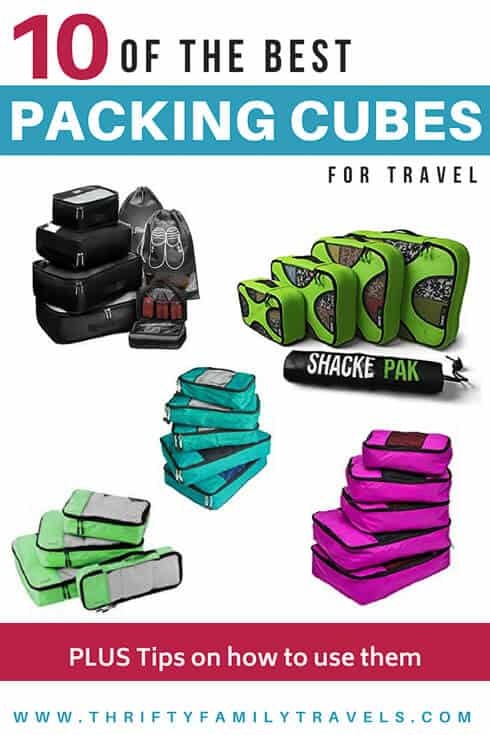 Also check out the Shacke Pak website to see how do packing cubes work as well as example packing lists, videos and tutorials on how to pack with the cubes. 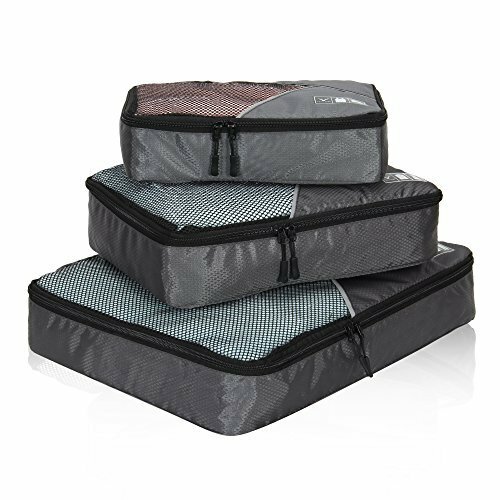 These large Dot & Dot packing cubes come in a set of 4 and will ensure packing and unpacking is stress free, whilst you will easily find what you’re looking for whilst traveling. You have the choice of 10 vibrant colours, or a multi-colour set, so each cube is a different colour. I highly recommend the multi-colour set – this is what we have and so each member of the family has a different colour making it easy to identify who’s cube belongs to who. These packing cubes are light weight and store flat so you could easily store them in one large packing cube when not in use. Each cube is made from water resistant honeycomb fabric, have a durable zipper with two pulls, and a partial breathable mesh front for ventilation and visibility to see inside items. They also have a carrying handle perfect for hanging in hotels. 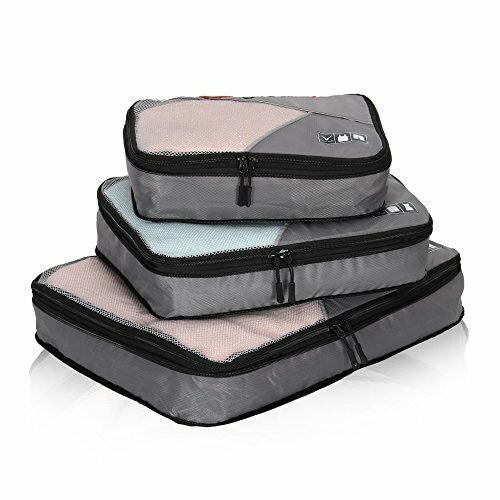 For travellers who have difficulty planning or staying organised, these packing cubes are a no brainer. They also come in medium, small and slim sets that you can buy separately. 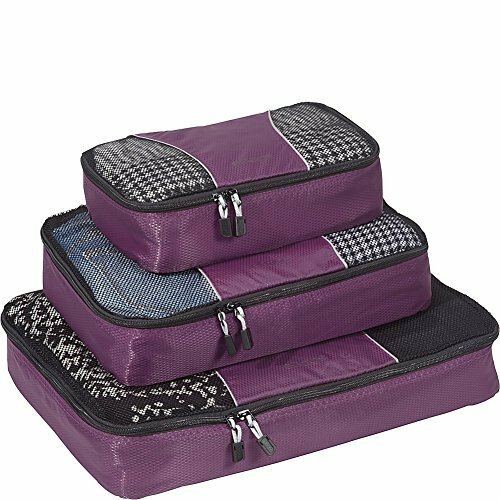 If you like the idea of being able to unpack at your holiday destination in no time at all, these eBags packing cubes are a must buy, as they become drawers for your drawers in your accommodation. The ebags packing cubes sizes includes a large, medium and small packing cube and comes in 10 different snazzy colours and patterns. The different colours and sizes allow you to pack in a way that you know where everything is, i.e. beachwear, underwear, shoes, toiletries etc. Each cube is made of quality breathable nylon, premium zippers and interior seams that ensure a snag-free inside that never frays, in addition to mesh tops to keep things airy. Read any ebags packing cubes review and you will see customers highly recommending them. They are also backed by a lifetime guarantee so it will be an investment you will never regret. These AmazonBasics packing cubes come in a choice of 6 colours which will be handy if you wanted to allocate different colours to different clothes or different family members. The packing cubes amazon basics set includes 2 large and 2 medium cubes, each with an easy to use double zipper. The cubes are made of durable, lightweight nylon fabric together with a handle for easy grabbing, carrying separately, or hanging. The soft top mesh panels offer not only important ventilation, but also a viewing window to easily identify what’s inside. This set does only include medium and large cubes, so is better suited to travellers that want to store their clothes. You may want to supplement the set with smaller packing cubes as well. If you’re looking for a cube set for the whole family, then look no further than these Pro Packing cubes. They come in 1 large, 3 medium and 2 slim cubes with the largest being the same depth as a standard suitcase, so when full it fits perfectly. If you position the zippers so they’re top/centre, you can reach in and grab what you need without unpacking your suitcase. Made from ultra lightweight nylon with strong easy to glide zippers & durable reinforced seams. The mesh inserts are thick and strong whilst allowing for great compression and air flow, and the handles mean you can transfer each cube when at your destination very easily as well as hang them up. This set comes in 5 colours and 2 different mixed colour sets. As I have said before I highly recommend the multi-colour sets over the sets in the one colour as you can allocate different colours to each member. The Hynes Eagle travel compression packing cubes for being organised and be able to find items easily without the frustration of digging through everything. These polyester packing cubes come in 3 colours and 3 sizes, large, medium and small. Each cube is topped with breathable mesh fabric for better airflow and helps in finding belongings. They are fully expandable via the dual zipper, which results in 50% more compression, allowing you to maximize the space inside your luggage. With carryon luggage, you will be surprised on how much you can compress your clothes whilst also ensuring you don’t have your underwear falling out while you look for a phone charger in the airport. 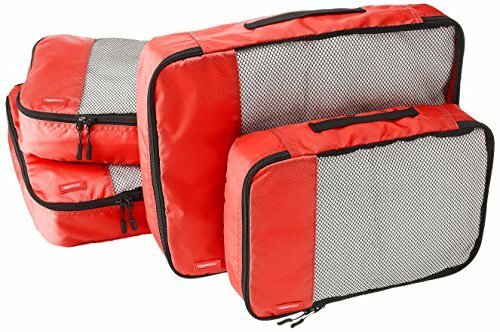 I would recommend this 3 piece packing cube set to the traveller that always overpacks as these cubes are very sturdy and perfect for compression with their expandable zip.